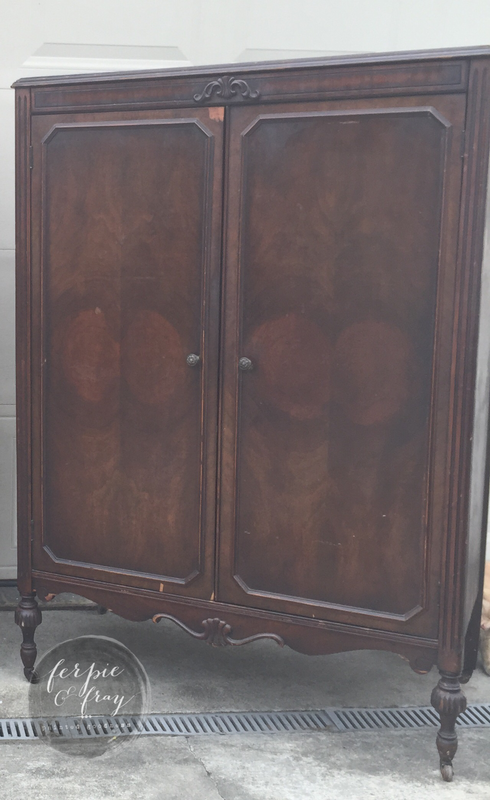 Working with antiques, there always seems to be popular pieces that everyone needs and rare pieces to find… and they are usually one of the same. Matching pairs fall into that category.. it seems like whenever I stumble across a pair of matching nightstands they don’t last very long. So of course, if I find them I always, always buy them. Plus they are so fun to paint. 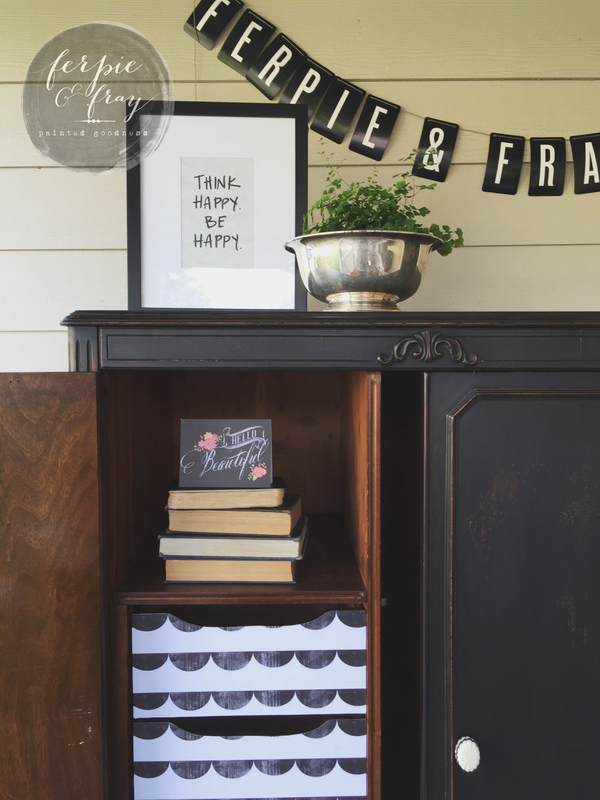 These particular ones are a double WOW… mini bookshelves that MATCH. gah! The moment I found them I ordered paper… because the inside needed something really fun. I choose a great print from Spoonflower called Navy Waves by mgterry. I like this one because it is subtle and modern but still pretty classic… slightly nautical. Mike said he thinks it looks like necklaces.. I like that too. The wood was mahogany and they had a leather detail on top, so I primed before painting and went with General Finishes Snow White, its a nice bright white and matched the white of the paper perfectly. Pretty simple but fun makeover for you. I have a good and very busy line up the next few weeks. The shop is busy and my custom calendar is pretty full so I am excited to share more with you soon! Summer is in full swing and around my house that means planning fun days for my kiddos while trying to get in a little (just a little) time to paint. This summer has been a little easier than I thought. I really like a good back stock of furniture, it helps with my creativity and is very helpful when working with clients. But that usually means my studio (a 2 car garage) is full, at least it has been this past Winter and Spring. A few weeks ago we reorganized and played the stacking game. It cleared a lot of space! It is so nice painting out there again. It feels like my own world, even if its not nearly as organized as it used to be. So for the past two weeks I have been able to play with the kids and work for a bit throughout the day. Its working nicely. I feel like with most shades of yellow its important to put on a few extra coats and pay some attention to coverage. Its a harder shade to get right. Speaking of shade, this is my first time using this particular one… and I think Im a little shocked myself because of WHAT shade it is! Its Miss Mustard Seed’s –Mustard Seed Yellow. I ordered it a few months ago…Ive been eager to try new shades and explore some newness altogether. I was really happy with it! My usual go to Mustard is a bit darker so it was a slight change but much softer. I really enjoy Marian’s color palette in general, I am so drawn to her greens and have used them quite a bit in the past. 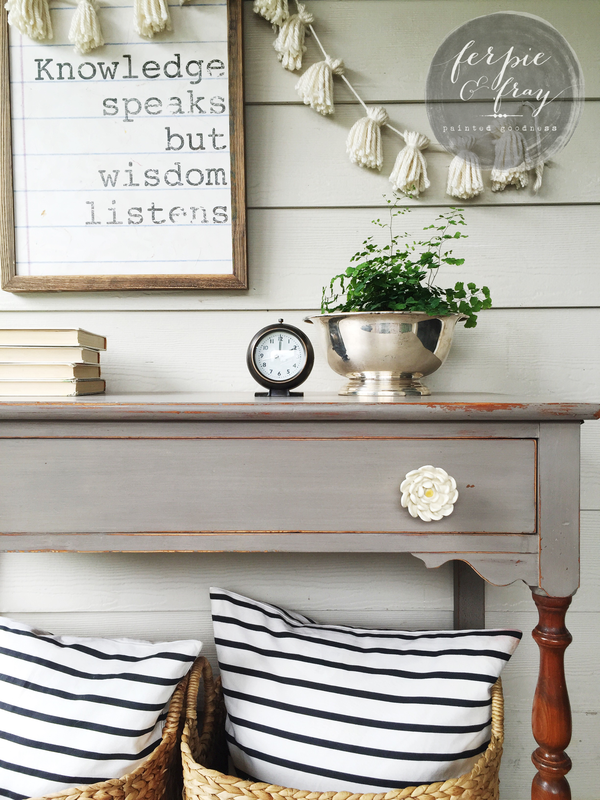 This yellow is a perfect mix of soft subtle cottage-y yellow with a bold mustard tones. 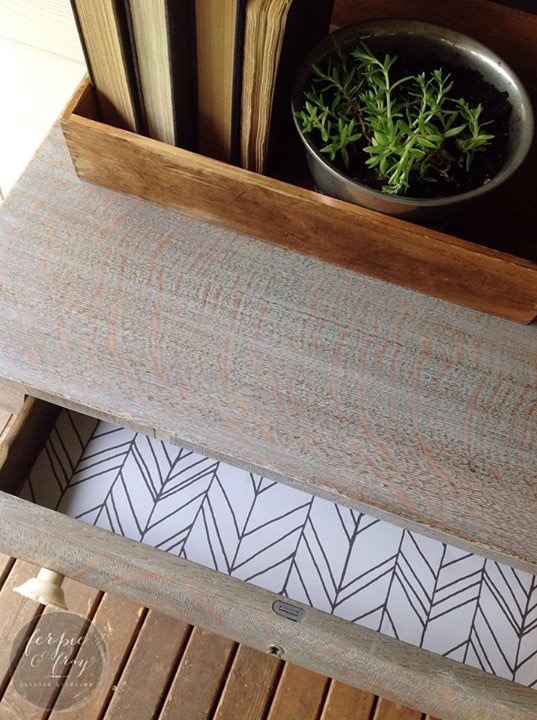 Paper is a huge part of what I love about painting furniture. I think its so fun to open a piece and see a fun pattern inside, and it really cleans it up and makes it feel new. Im working on a little more info for you on this topic so stay tuned. This print is one I ordered a long time ago from Spoonflower.com (more on that later too). I live a bit in the country here in the Pacific Northwest, down the street from my house there is a gravel path about a half mile long leading to our favorite lake. Most summers we spend our days swimming with Clementine in the water. This summer has been idling in the 60’s somedays and we are lucking for low 70’s, so we haven’t been able to enjoy it as much. But between coats of yellow we ran up there and took the dogs off leash and let them play. Charlie is growing fast and testing Clementines limits of patience. Here is a very quick post I did a few years ago when we took Clem to the lake to swim. I actually really love the low temp summer we are having… It’s like Fall or an extended Spring. I have some fun pieces planned for the next few weeks! Have a great Sunday! 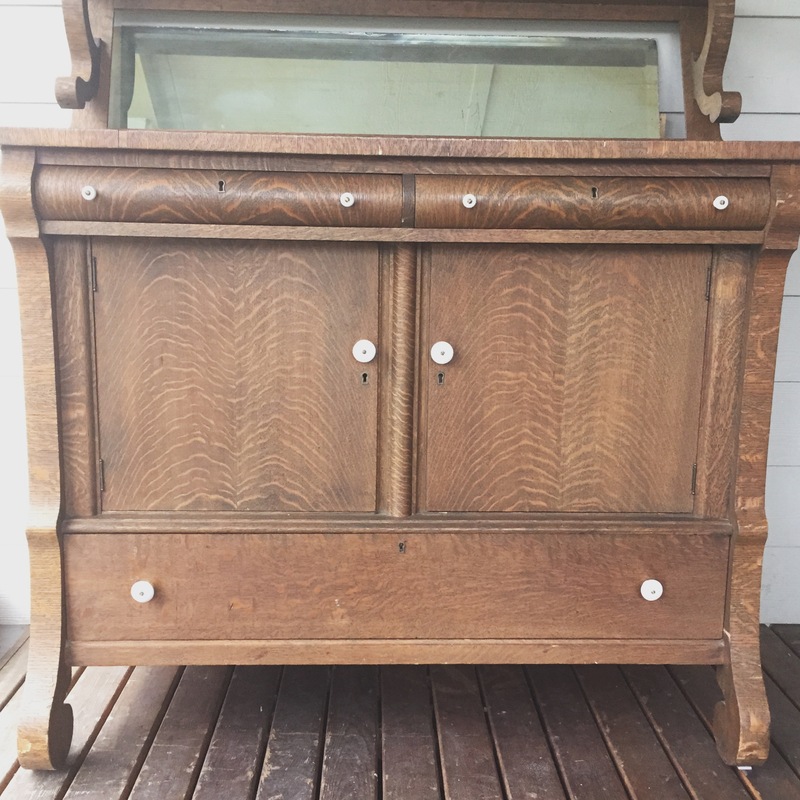 Empire dressers really are something special. Just like buffets, sometimes they are hard to find while other times I feel like I can get them pretty easily. 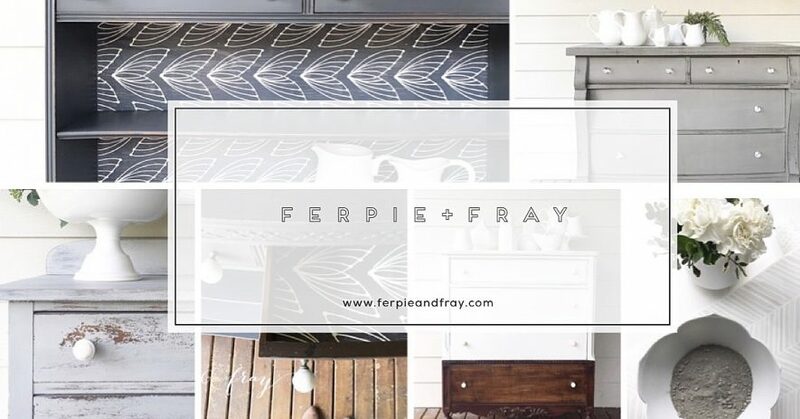 I love them because the bones are so detailed and over stated so you can really do any color and create a pretty neat statement piece without doing any over the top designs. With this piece I wanted to just do a simple clean light grey. The paper was one I ordered a long time ago and had in my stash, Audrey thought it was pretty so we went with that. For about the last year my studio has been stacked with my back stock so I have been painting in my dining room. Plus its so cold out there! I got in another huge delivery and reorganized the space and ended up with about a 1/3 of my studio back. Which was kinda odd, considering I added 15 pieces! I was so excited to paint in there again. I have shelving with all my supplies, it always inspires me to try new things and create different designs. Its like a personal Pinterest board in my own home. Im excited to take it back over. This piece really shines in person. the lines are clean and smooth but still has a aged feel. I called Mike on his way home on Tuesday and asked him to grab flowers (and ice-cream). Having flowers around the house make me happy, and I just needed that this week. When he came home with hydrangeas I cringed because I am not great at keeping them alive. I mean Im not great with any greenery but Im particularly bad with hydrangeas. But I recently read a post from She Holds Dearly about how to keep them fresh. I am happy to report it is Friday and they are still alive! Thank you dear friend for your advice. (Sarah took my paint class over a year ago and she is so delightful). This past weekend I went to Snohomish, WA with a good friend that told me I HAD to visit. Such a great town, filled with antique shops, artisan food, and handmade ice-cream. We had so much fun taking it all in. Among other treasures, this cute little metal hand came home with me. I liked how odd it was and its perfect for my little photos. And finally those flash cards that say “beautiful daughter ” hang on my daughters door … and it makes me smile every time because raising girls is SO full of heart. Her and I are working on kindness, and empathy. I want her to grow up with love in her heart for others. Even if its hard. Even if it feels better not to. I want to teach her to not be a victim but to have understanding for everyones journey. I think even as an adult I am learning with her. Learning to grow my heart and faith in people. Love, is really important… to pretty much everyone. She is such a beautiful girl. Hope you all have a happy weekend. This piece was a fun one to work on. I want to say I had this desk for over a year in my backstock. I had stacked it in the back and kinda forgot I had it. A few weeks ago I did a major “summer” clean in my studio and was instantly inspired when I say it again. I’m glad I saved it for the right time. 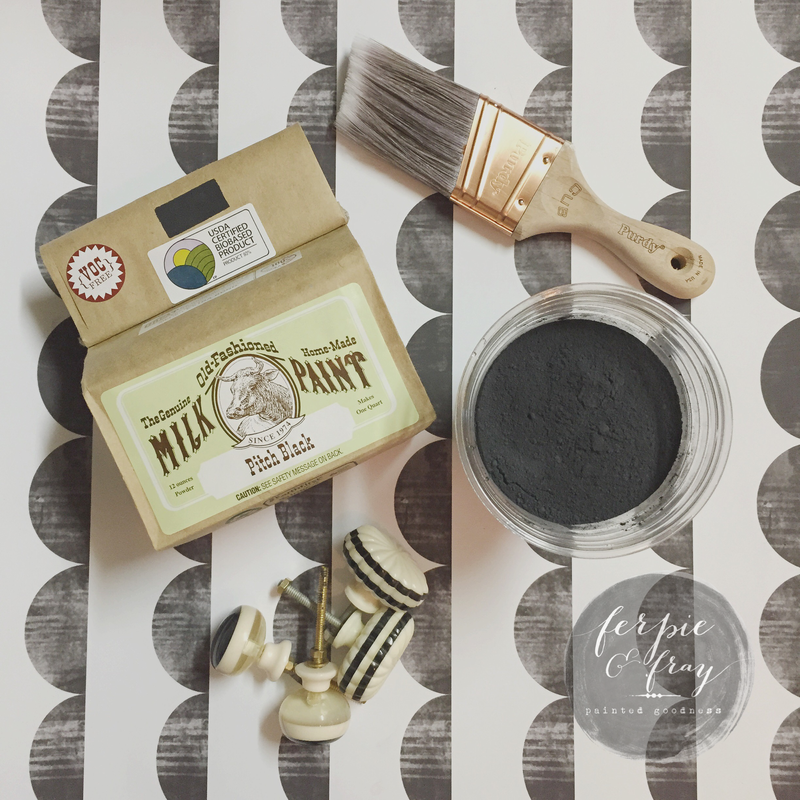 The Real Milk Paint Co. Oyster Grey seemed to be an excellent choice. I’ve been kinda obsessed with their paint lately. 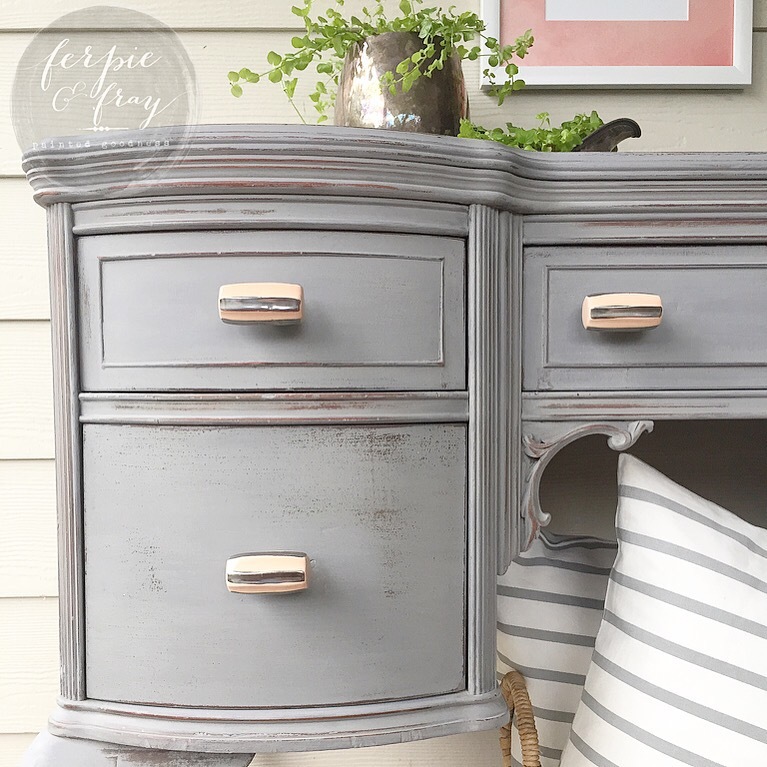 I work with milk paint a lot and this one mixes really nicely and I love the coverage. 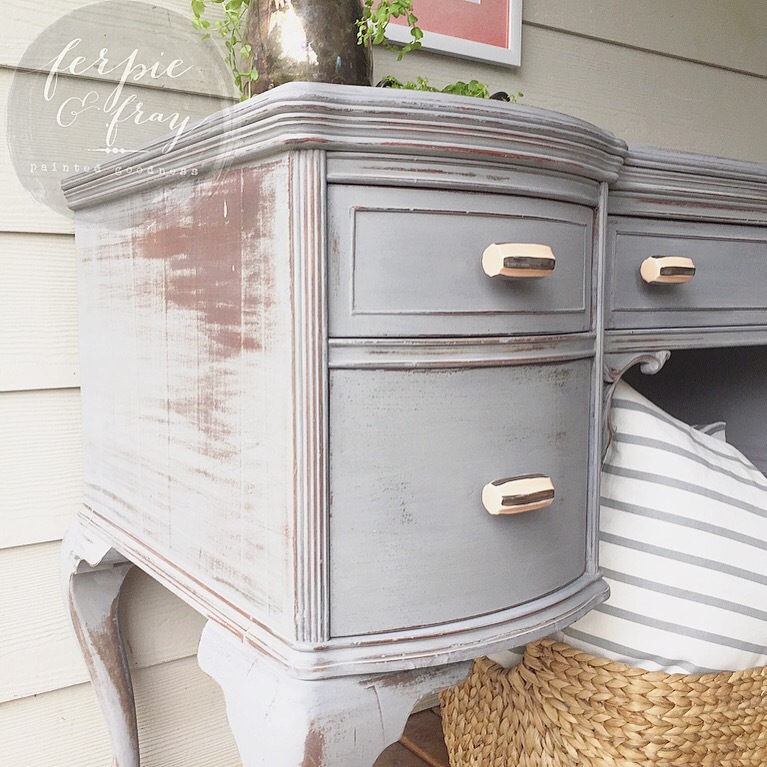 I had some left over from the milk paint class I taught a few weeks prior and knew I loved the perfect cool grey hue. I don’t have a before of this piece but really all she needed was a good light sand and I used a spray Shellac to block the bleed through on the top. I always like to work up a little “design board” for myself to see how the paper and knobs will mesh with the paint colors. It gives me a visual of the project. I can’t even tell you how much I love this shade. It’s like my long lost grey soulmate. I’ve been searching for it my whole life. Ok… Maybe just a year or so. But it really is perfect. And I only needed two coats. 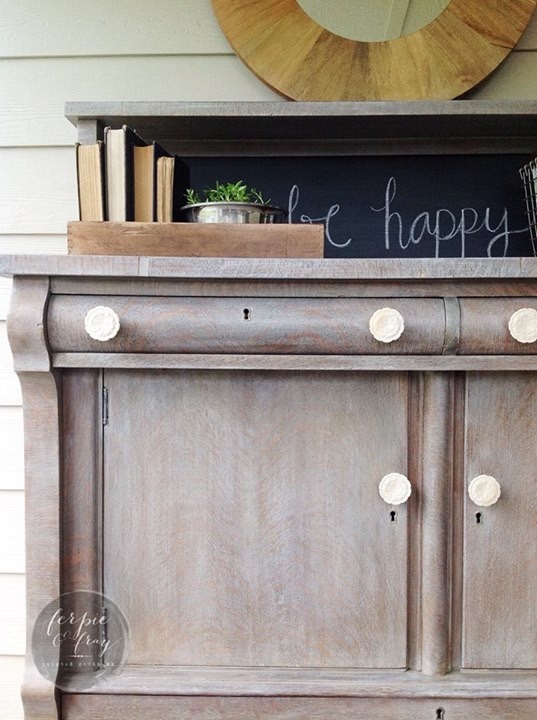 Knobs are Anthropologie (on sale) their knobs are worth the splurge especially if they greatly impact the piece. Paper is Spoonflower artist: Leanne Hatch. I think the grey tones down the ornate details and kinda simplifies the overall design. I’m excited to paint with this color again… It’s such a good one! I have to tell you I have been blown away by the amount of support for my little business last week. 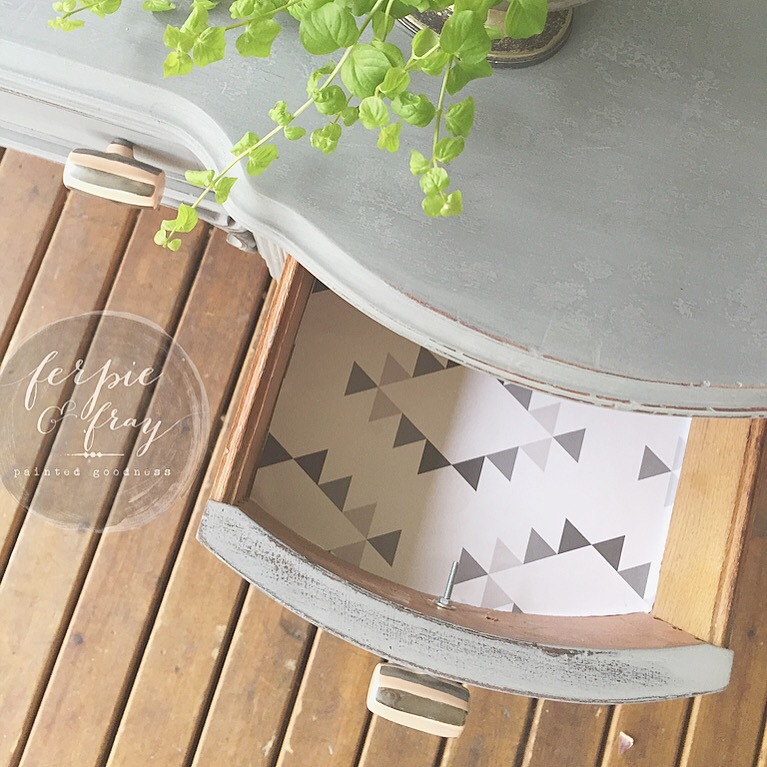 I have been selling a lot more from home lately while maintaining a pretty good stock at The Modern Cottage Co. I finished 3 pieces for sale (and 2 for a promo…more on that later) and each piece sold within a few minutes or hours of being posted on my Facebook and IG. It’s amazing to me that people are following my work and get excited about what I do. I had a few “pinch me” moments and I’m so grateful for continued growth and the supportive people around me! 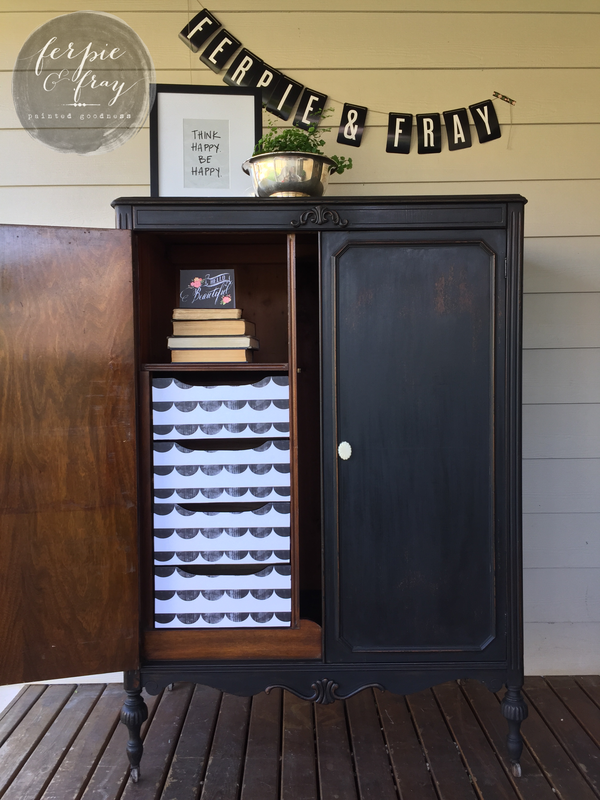 I have a few “before and after” photos for you..first up the armoire. This piece would have looked amazing any color. It’s bones are beautiful and I love pieces with drawers hidden on the inside. It’s a great opportunity to paper or paint something fun. I wanted to keep it simple with basic black and have a coordinating paper inside. 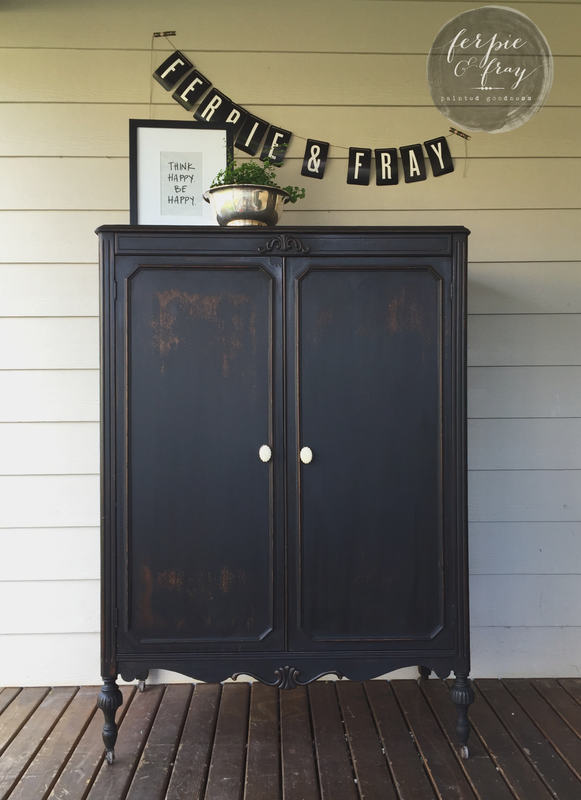 I chose Pitch Black from Old Fashioned Milk Paint Company. 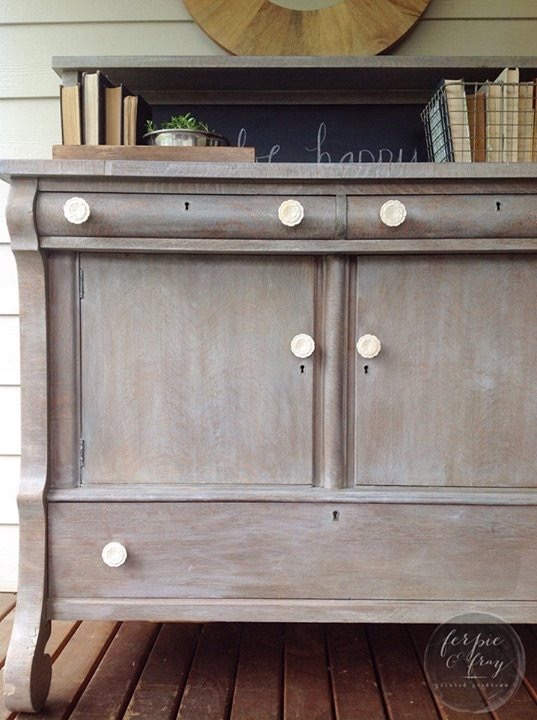 You get the classic color with a milk paint choice but you still get character in the chippy patina. The awesome scallop paper is from Spoonflower (@littlearrowdesigncompany). I honestly did no prep work other than cleaning the piece. 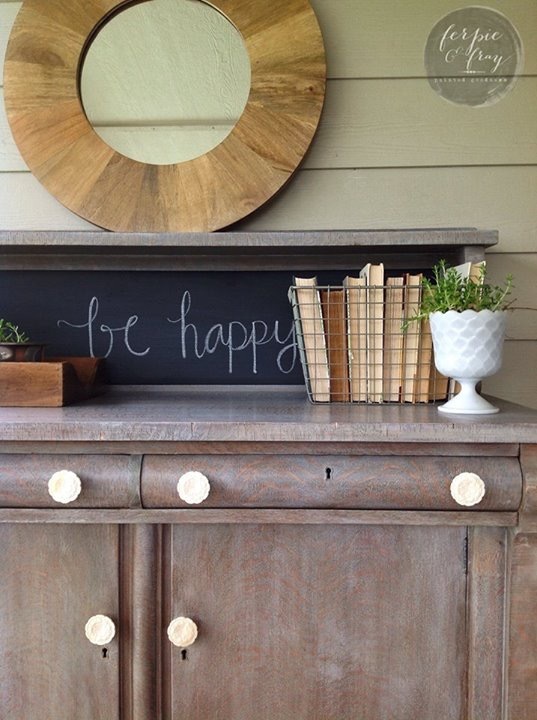 The wood was in good condition and I wanted the milk paint to do what it does best. I sealed first with Maison Blanche Dark Wax (this continues to be a favorite, I love this stuff). I waited over night and went over the whole thing again with clear wax. 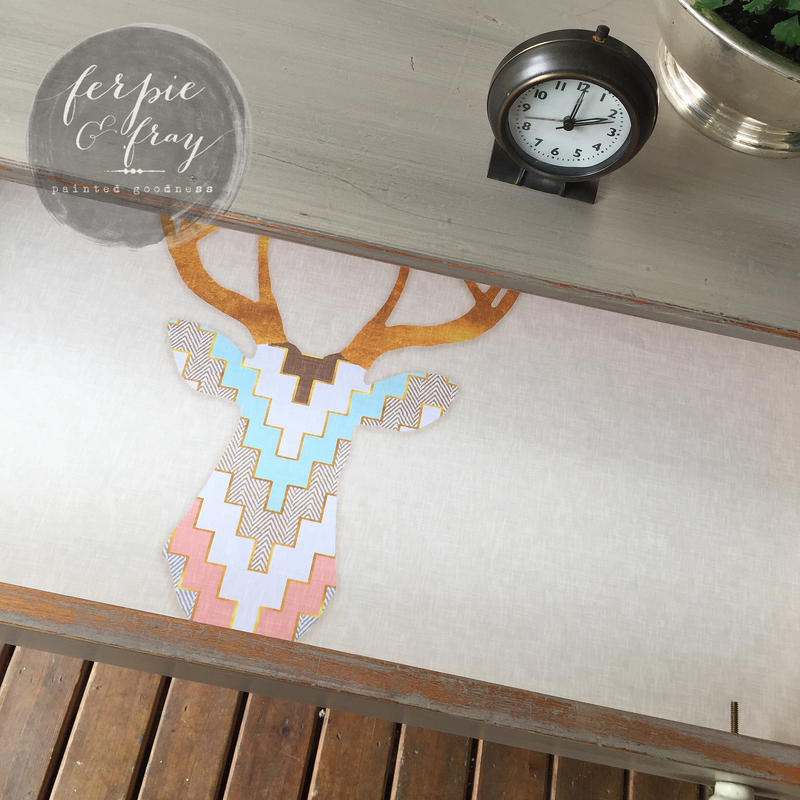 My next piece was originally going to be green but I kept reaching for this awesome deer print (also Spoonflower @Sparrowson)and I thought Driftwood (OFMPC) would be a good match. 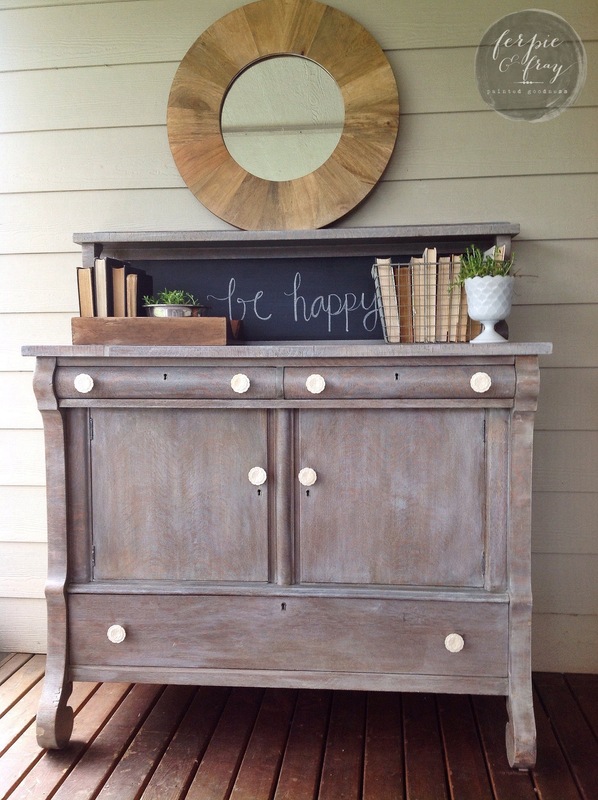 I did 2 coats of shellac on this one and mixed a little Light Cream milk paint with Driftwood. I like it slightly lighter. 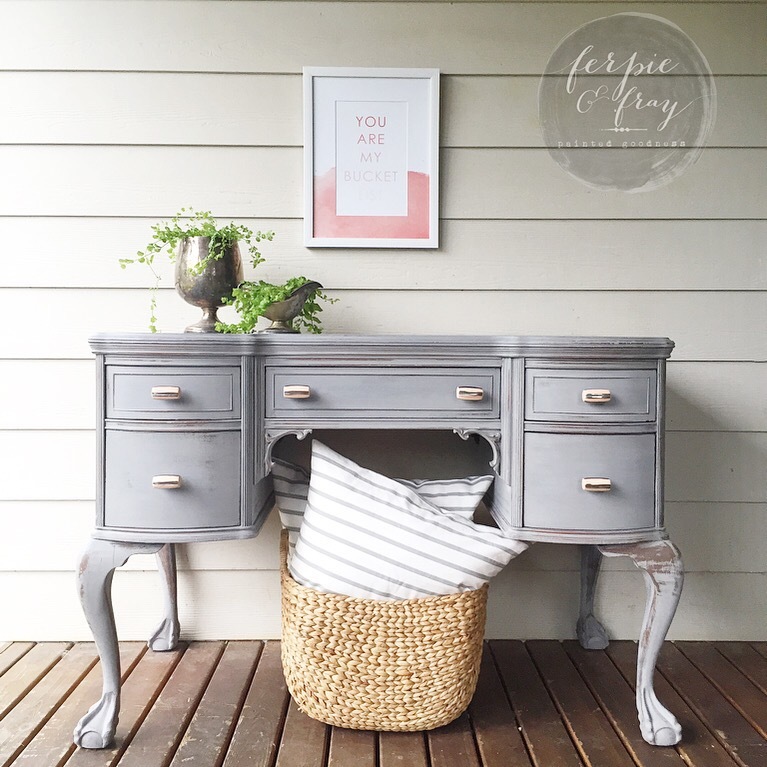 Posted in Before and After, Uncategorized	Tagged Old Fashioned Milk Paint Co. When I bought this piece, I was a bit torn on what to do with it. I was deciding between a vibrant rich blue and coral. For me the most perfect pieces are usually the ones that are the hardest to paint. They will look pretty in any color and the options are endless! 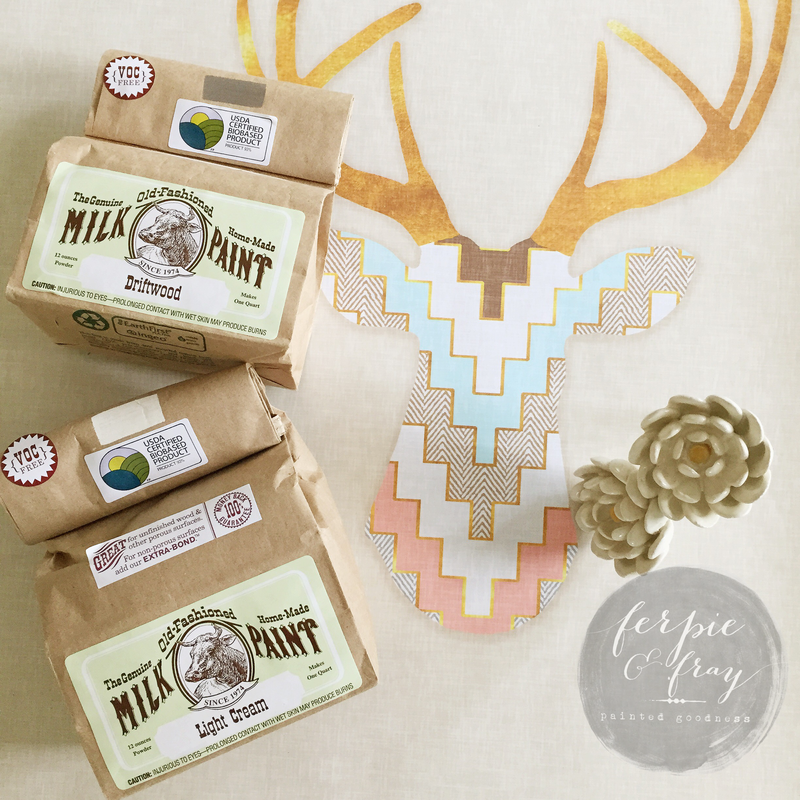 I really wanted to paint in Apron Strings again (by Miss Mustard Seed Milk Paint). This color is so fun, it’s sorta a peachy pink and paints like water colors. It takes longer to sell, maybe because it’s more feminine and a little taste specific. I knew it would be risky but artistically I was really drawn to it. So glad I listened to that, it ended up being a piece I am really proud of (and it ended up selling within just a few hours!) woot! 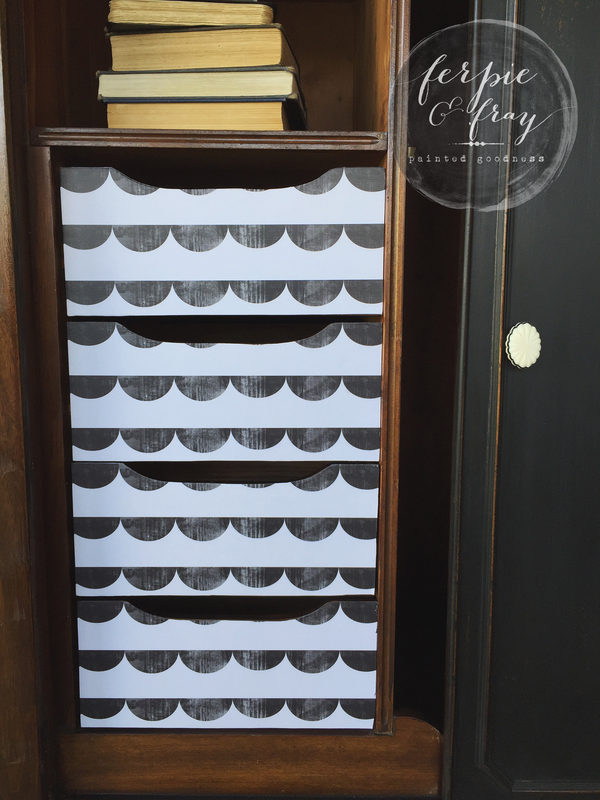 The drawers are lined with Spoonflower paper (by: littlesmilemakers) and I used General Finishes Satin Finishing Wax to seal. Here’s what she looked like before.. This piece was a fun one, I was surprised by the response and sweet comments from my Facebook and Instagram feeds! What a lovely community of fellow painters and friends. Fills my heart! With the support of Alison at The Modern Cottage Company I have decided to start offering paint classes. I really enjoy talking paint and thought it would be a lot of fun! We posted the first Painting 101 class for May 9th and sold out within 24 hours!! So we are scheduling another intro class for May 30th. This class will cover the basics of prep, painting and sealing of a vintage chair that they get to take home. 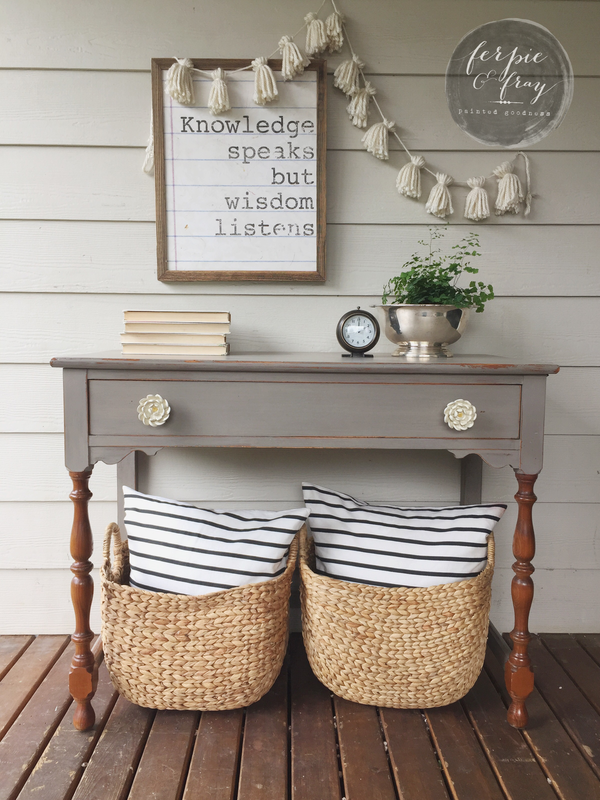 I’m looking forward to planning a number of other classes including a Mommy and Me and Milk Paint. One that I am really looking forward to is a creative class. This class will cover Mod Podging paper, different waxes, glazes, General Finishes Pearl Effects, layering, rub n buff, etc. I get emailed a lot about some of these things and I think people will have fun playing with some of the techniques. It’s really about being creative and making it your own. Hope you are having a fantastic weekend! 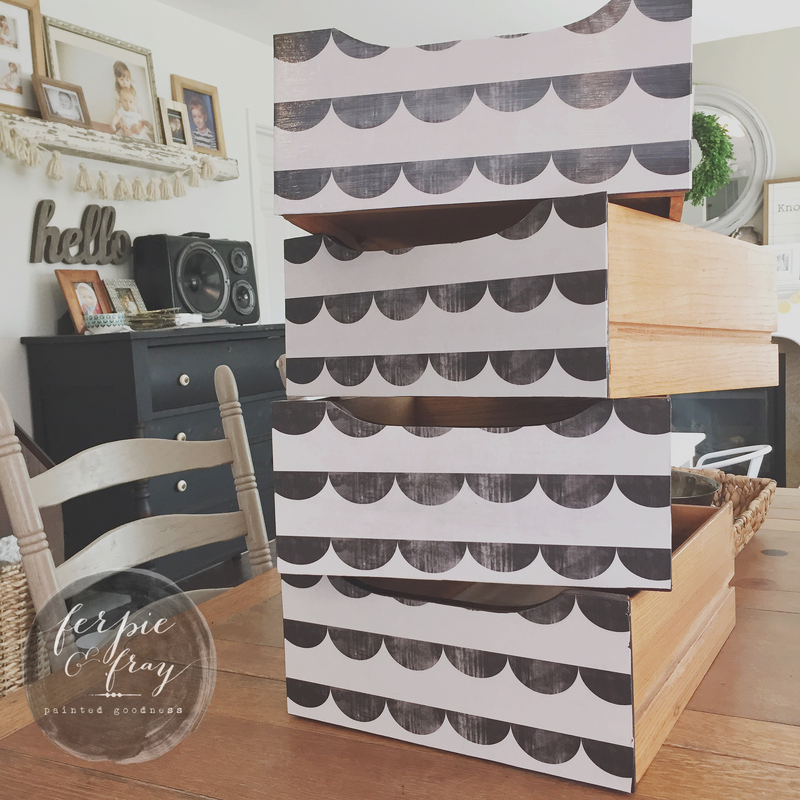 I really wanted to write up a post on this buffet because I feel like the process was so fun and very easy. I have been couch bound this week with a horrible cold and I finally feel ok enough to write a little something. So first things first… these empire style pieces are awesome. I love the chunkiness and curves in their character, it is by far the best to paint. However they are endangered and getting harder and harder to find. So when I do, I like to do something different and exciting. 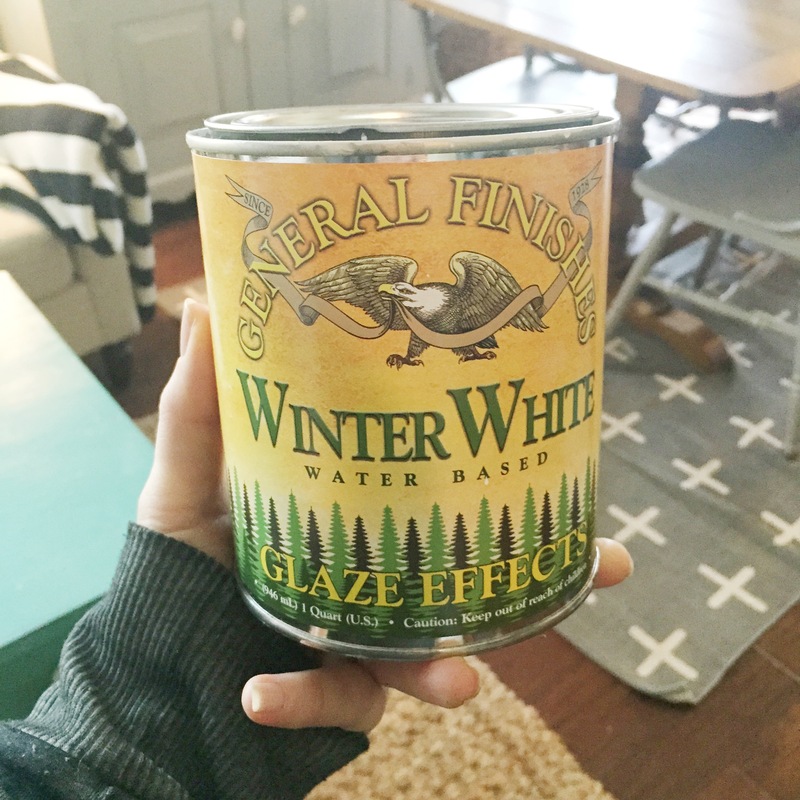 I have been really into General Finishing lately, probably because my friend Alison started selling it in her shop. We are always chatting about fun combos and experiments to try. The team at The Modern Cottage Co. is really awesome about that. We run things off of each other and even support what seems like crazy ideas. I did a paint demonstration there this Saturday and I was telling the customers that came to watch that you should try not to limit yourself to the instructions on the back of the can. Use what you read as a guideline to the “rule of thumb”. Experimenting and making mistakes will make you a better painter and artist. Its ok to try layering and different techniques to see what the outcome is. With that being said be careful, you still want to take care in your prep and sealing. I came across this glaze in Winter White by General Finishes. I kept wondering what it would look like over a pretty Oak finish? So when I found this buffet it was a perfect marriage to my vision. 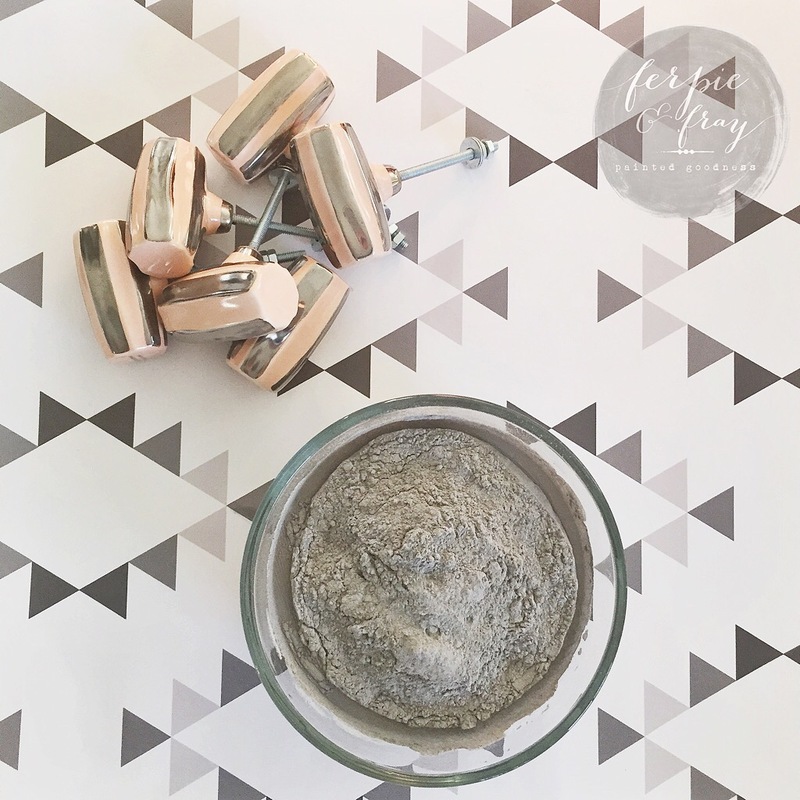 This product is super easy to use and almost gives an effect of white wax. I could see this being a great layering product over paint. The glaze is applied by brushing it on and then wiping the excess away, leaving behind a pretty translucent finish. 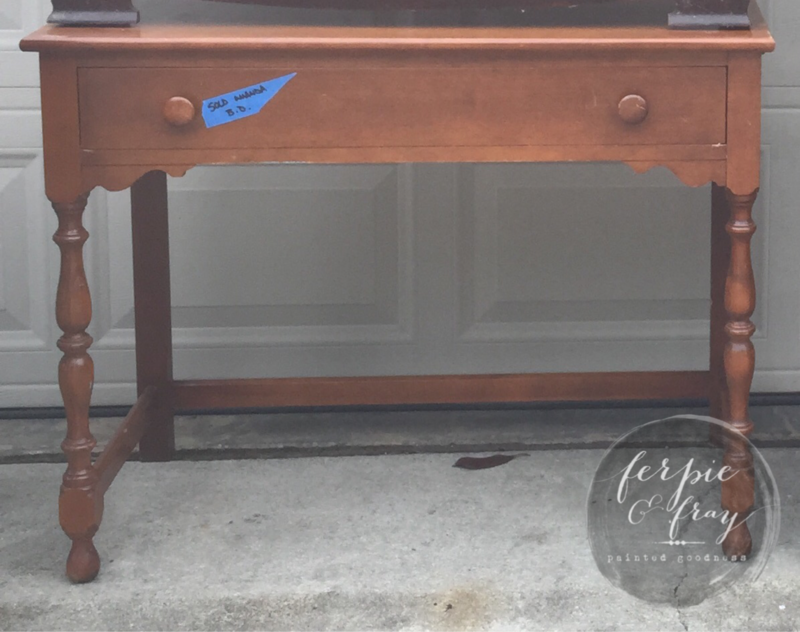 My prep work was really just a simple light sand with 220 grit and I sealed with General Finishes High Performance Top Coat in Semi-Gloss. I later went back and just rubbed the glaze in certain spots to enhance the white. This was a great way to create a driftwood look, and really did take under an hour to apply. This one is for sale! $495. 😊I might try to gather some photos and do a post on the Pearl Effects next (which is what I used in the demo)… that was a lot of fun to work with and a very unique product. Have a great Thrusday!